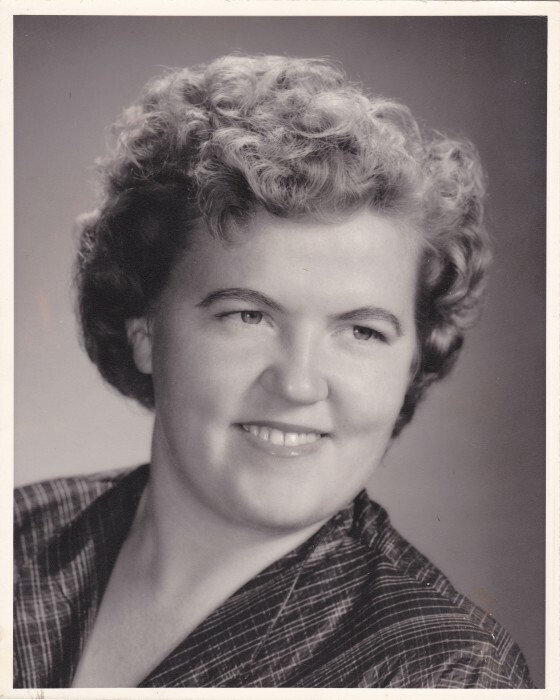 Obituary for Rose (Arbogast) Clark | Demaray Funeral Service, Inc.
Belva Rosella Arbogast Clark 89 of Shoshone, died Wednesday morning November 28, 2018, at her home in the Lincoln County Care Center in Shoshone. She was born November 22, 1929, in Mesa, Arizona to parents William Henry Arbogast and Clara Belva Sargent. She was the oldest in a family of three girls and two boys. She joined The Church of Jesus Christ of Latter-day Saints when she was eighteen and was a member of the Shoshone Ward at the time of her death. She married Farrell Clark on May 24, 1954, in Ajo, Arizona and they moved to Shoshone, Idaho where she has resided for 65 years. He passed away in 1980. Her friends called her Rosie. She was the mother of two daughters, Jane and Dorothy; grandmother of three - Collin Madison, Michael Anderson and Ashley Anderson; a great-grandmother to Lydia Vera. She was overjoyed when her grandchildren came to visit. A homemaker though not a professional seamstress, Rosella loved to sew and did an excellent job in her younger days making her daughters’ outfits as well as her own and sometimes for others outside of the family. She loved fabric and in her senior years kept a collection of small pieces in various textures and colors or patterns hung on a rack where she could see them. It was art to her. The family remembers her wonderful mashed potatoes and was called on to make them at any family dinner. She loved cats and all baby animals and had empathy for the stray ones. Rosie was of mild temperament and she learned to think positive and be happy by doing that. Homebound for many years, she made the best of her situation still reaching out to others with compassion and love. Friends were always welcome and family most dear. “Amanda” was Rosie’s faithful caregiver for eight years before she became a resident of the care center in which she has lived in for the last three years. Amanda went the extra mile to do things that made a happy day or brought a smile to Rose. Things like bringing baby animals into the room whether it be a baby piglet, duckling, chick, or a puppy. Rose was the adopted grandma to Amanda’s three girls, Shaylin, Raylin, and Katelyn. The family would like to thank the entire staff of Lincoln County Care Center for their extraordinary love and care they gave to Rose. They helped celebrate Rose’s last birthday on November 22 with ice cream and orange cake (her favorite color). Rosella was preceded in death: by her husband, Farrell; second husband, Martin; a daughter, Dorothy Mattison; a grandson, Michael Anderson; and two brothers, Bill and Fred Arbogast. She is survived by: a daughter, Jane Houst of Shoshone; granddaughter, Ashley Rose Anderson; a granddaughter, Ashley Rose Anderson; and a great-granddaughter, Lydia Rose Vera both of Boise; a grandson, Collin Mattison, and son-in-law, Brad Mattison both of Twin Falls; also, two sisters, Elsie LaBass of Hurricane, Utah, and Louise Reid of Ajo, Arizona. A funeral service will be held on Friday, December 7, 2018 at 11:00 am at The Church of Jesus Christ of Latter-day Saints in Shoshone. A private burial will follow at the Shoshone Cemetery. A viewing for family and friends will be held on Friday from 10:00 am until service time at the church. In lieu of flowers donations are appreciated to help with funeral expenses or to “A Road to Home” Pet Rescue (susie@acehardware).